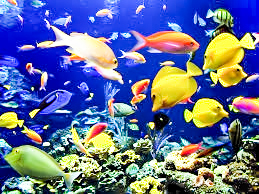 Many animals that live in water are called fishes. A fish is a water-dwelling, cold-blooded animal, that has a backbone, and that breathes by means of gills, instead of by lungs. It normally has two pairs of fins, instead of arms and legs, as well as several other fins. Many fishes are covered with scales. 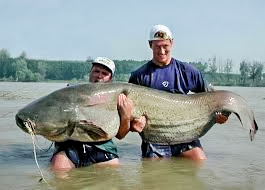 More than twenty-thousand living kinds of fishes are known, and new species are discovered every year. This is more than all the other kinds of backboned animals combined. Other animals also live in the water, at least part of the time. They too, have backbones, and early in life, they breathe underwater by means of gills as well. 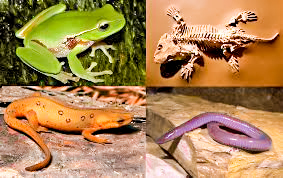 These are what we call amphibians, which are primarily frogs, toads, and salamanders. How can one tell fishes from amphibians? 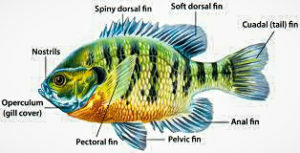 Fishes have fins as appendages, and most have scales that cover the body. But most adult amphibians are quite different. They have legs, and they don’t have body scales. Fishes never have true legs. The scales of a fish overlap each other, like shingles on a roof. The scales are not shed like the hair or feathers of mammals and birds. But if any scales are lost by accident, new ones grow to take their place. The most highly developed fishes are those with a bony skeleton. They are also the most abundant and familiar. The mackerel is typical of this highest order of fishes. 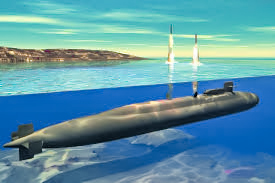 Observing how easily and swiftly fishes cut through the water, people pattern boats and submarines after their streamlined bodies. A typical fish is spindle-shaped, but somewhat wider in front of the middle. The head joins the body without a neck. The eyes are flush with the head. The gill openings are covered with a smooth flap. Only the fins extend beyond the body, and they can be pressed flat against the sides of the fish. These features help the fish to move smoothly through the water. Water resistance is further lessened by a coating of slime. Unlike human beings, most fishes continue to grow for as long as they live. Old fish may become very large. The exceptions are fish such as the salmon, which have a definite period of growth before spawning, and after spawning, die. Carp, are said to have a life span of up to a hundred years, but few fish in the wild actually die of old age. Though many fishes are believed to reach ages of fifty to a hundred years, scientific documentation for individuals reaching ages beyond fifteen to twenty years, in natural environments, is rare. 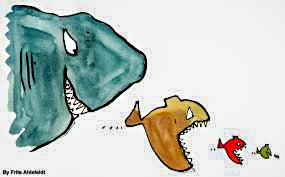 It is more likely that a predator will kill them, before old age does.